After three knockdowns, officials stopped the bout of Tiger Muay Thai and MMA Training Camp, Phuket, Thailand fighter Patrick Schmid mid-way through the first round at Bangla Boxing Stadium on Sunday night. “Can’t hold anything against him, he had a hard head – I hurt my (left) hand,” Schmid said after the fight against 29-year-old Thai national Taneelek, while showing his swollen fist. Schmid, a 25 year-old kickboxing veteran from Switzerland, started the fight with strong punches and manhandled Taneelek throughout the bout. Big Swiss would get his opponent in a clinch seemingly at will, dropping Taneelek the first time with a strong left jab. “The first knock down he was basically out from his feet so I just had to finish him off,” Schmid, now 7-0, said. 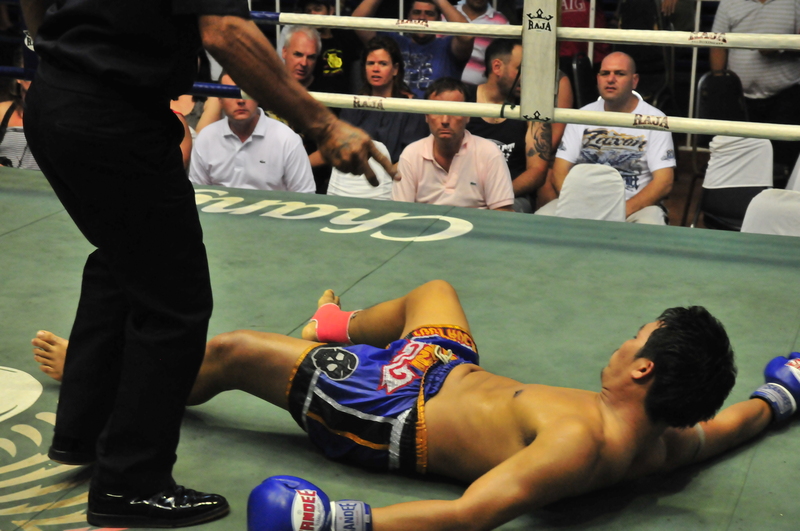 The second knockdown came immediately after Taneelek, a veteran of over 80 fights, rose to his feet. Schmid again grabbed him in a clinch and landed two strong knees – one to the rib and one to the face as he fell. For others that would be enough, but Taneelek got up once more only to fall for the final time again while in a clinch and took on two more strong left knees to the sternum. “He was a strong fighter. I give him a lot of credit,” Schmid said. Earlier in the night, 20 year-old American Ryan Spadafuce made his Muay Thai debut against 28-year-old Yodaek, who has over 60 fights under his belt. Though Spadafuce went the distance, he lost by decision. Spadafuce came out aggressive in many instances and showed immense poise under pressure. He traded heavy kicks with Yodeak and landed several strong elbows while in a clinch.